The Orient Electric Summer King XL offers a simple and elegant design with technologically designed aluminium blades that offers high air flow and thrust. This streamlined economy yet beautiful fan has perfectly balanced ribbed blades and has pressure die-cast motor cover. The Orient Electric Summer King XL offers a simple and elegant design with technologically designed aluminium blades that offers high air flow and thrust. 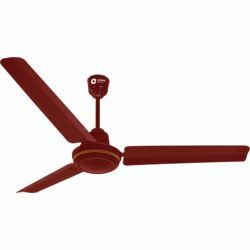 This streamlined economy yet beautiful fan has perfectly balanced ribbed blades and has pressure die-cast motor cover.